The cabin air filtration system in your 1999-2010 Grand Cherokee keeps you breathing easier whether you're powering up a remote and dusty wilderness road or commuting through urban smog. 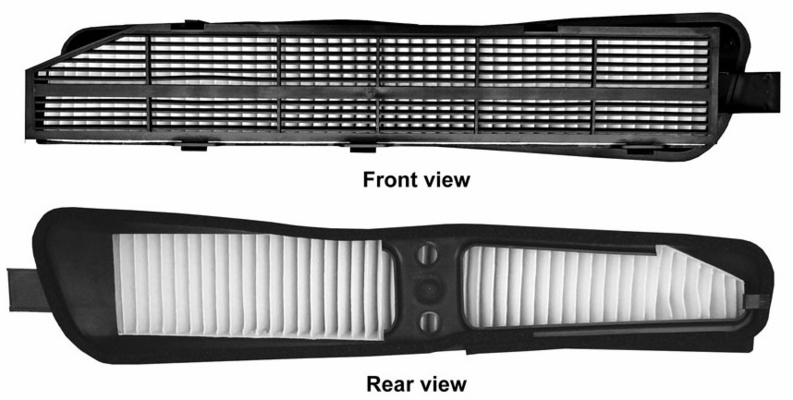 When it's time to change the filter, your most economic option is this cabin air filter kit from Mopar, which includes not only the filter, but also the plastic housing. The kit is less expensive than Mopar's price for the triple-layer filter alone. Replace your cabin air filter so it can continue catching dust, dirt, pollen, and other airborne contaminants before they get to you. 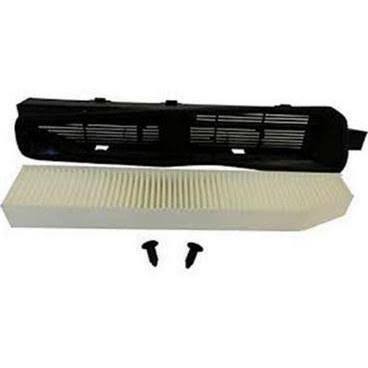 Cabin Air Filter, complete kit with housing and filter. For replacement filter please re-purchase this kit since Mopar has the filter alone (Part # 5013595AB) priced more than the entire kit. It great fit and seal dust out. The problem it box that tear foam stick off the plastic lip, will need to warp with plastic bag. The clip to metal is too short and tightness will harm foam, will have to remove it with only two plugs hole is good correct seal lip around metal without squeeze foam to thinner. The plastic clip lock is missed or slipping when install air filter, will have to duct tape it. Prosit awesome seal around with just two plugs hole is properly sack lip without tighten thinner. keep dust out inside jeep vent. i can fix little problem clips to seal properly and re fix foam on lip plastic. Consdid not warp bag to protection inside box cause foam stick tore half. plastic clip didn't clip properly lock instead duct tape. plastic side clip on metal is to tight, error measure, would have to remove clip, so foam will not damage from squeeze thin and ripe between metal over measure. Very simple installation, except the passenger side plastic clip was mis-formed and broke-off during first attempt to install. I was very careful, and focused on that one factor during the installation; didn't matter. Also, the 2 top clips that hold the forward-most filter housing piece closed, was so poorly formed that the clips down hold. I had to fabricate a fix to keep the housing closed. ConsCheap, cheap, cheap manufacturing material and/or design. Very disappointing for the $$$ spent. Arrived on time, Instructions were clear and easy to follow, Did not have to remover wiper blade, made instal easier. Fit was perfect. ConsNo wone knows it is there. Not a flashy upgrade. Easy to install. Instructions complete with illustrations. Took 20 minutes to install. Didn't remove the windshield wiper. Was able to maneuver the cowling away and squeeze the air filter and housing into opening. Would recommend this product even though Jeep didn't include as original equipment. The item fit perfectly - easy to install after I figured out that removing the passenger side wiper blade was not necessary. ProsExcellent fit - good quality. ConsRemoving the cowl was not necessary - with patience the old screen can be removed and the filter assembly can be installed. The two push pins were in the shipping box - one was lost temporarily in the packing paper - after that it was a snap - snap and done. I have no idea how long the filter is expected to last nor how to purchase a replacement. I wish I had bought an extra filter with the original purchase. This filter and housing was very easy to install and was priced below my dealer. Can't believe my WK Grand Cherokee didn't come with this stock! ProsEasy to install. Huge improvement in air quality. ConsInstructions are a little lacking, but there are several websites that have step by step instructions if need be.